Hale Avenue Resource Recovery Facility in Escondido, California utilizing digester gas from the wastewater treatment process to generate renewable electricity and heat for the facility's operations. As a result of this new system, all the biogas produced by HARRF's anaerobic digestors, which was previously flared, is now utilized to generate sustainable green energy. 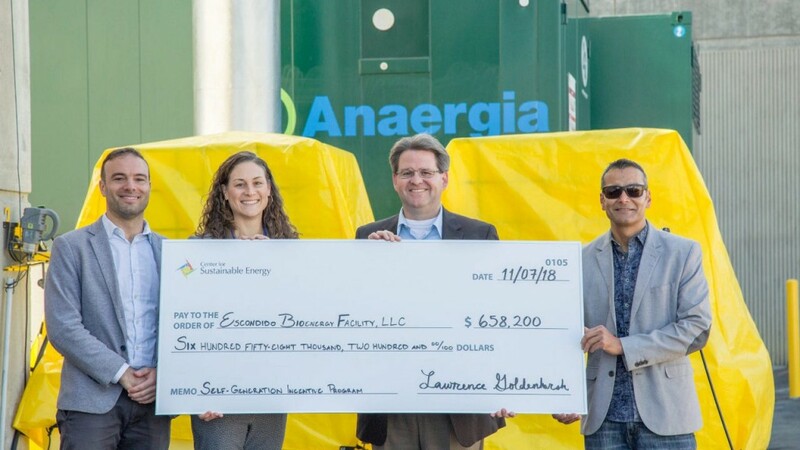 Anaergia and the City of Escondido have entered into a power purchase agreement, so that the electricity and heat are sold by Anaergia at below market rates, for the operations of the HARRF. The California Public Utilities Commission's (CPUC) Self-Generation Incentive Program (SGIP) supported this project. "The City has been continually upgrading and improving the HARRF," said Chris McKinney, Director of Utilities of the City of Escondido. "The utilization of biogas to generate renewable energy is an important step in optimizing this Facility's operations and has been a personal goal of mine." "The implementation of renewable energy initiatives that have a positive impact on the environment is something that is increasingly vital," noted Andrew Benedek, CEO of Anaergia. "The fact that we are partnering with the City of Escondido to do this here at the HARRF is an achievement that has benefits both for the local community, and for the environment." Lindsey Hawes, Assistant Director at the Center for Sustainable Energy commented: "The SGIP is a part of California's efforts to lead the nation in the adoption of clean energy technologies. Locally, residents can benefit from projects such as this new CHP system as it produces renewable power, reduces electricity grid demand, and helps curb fossil fuel-generated greenhouse gas emissions."